Chapter 1 is not over yet, still a few pages to go. We need to find the door again to get in and get out and get away from the Buddy. With the standard “to be continued . . .” because comics. Chapter 2 will have an updated version of our heroine sporting a new scruffier hairdo. Also working on that leather outfit, it seems so impractical, but we haven’t met whoever made it for her. Maybe in Chapter 3! Hair is tougher than it looks and I was close to obsession shaping it in Maya. This render was made in one of my favorite tools Character Creator 3 with some extra bits in Photoshop. 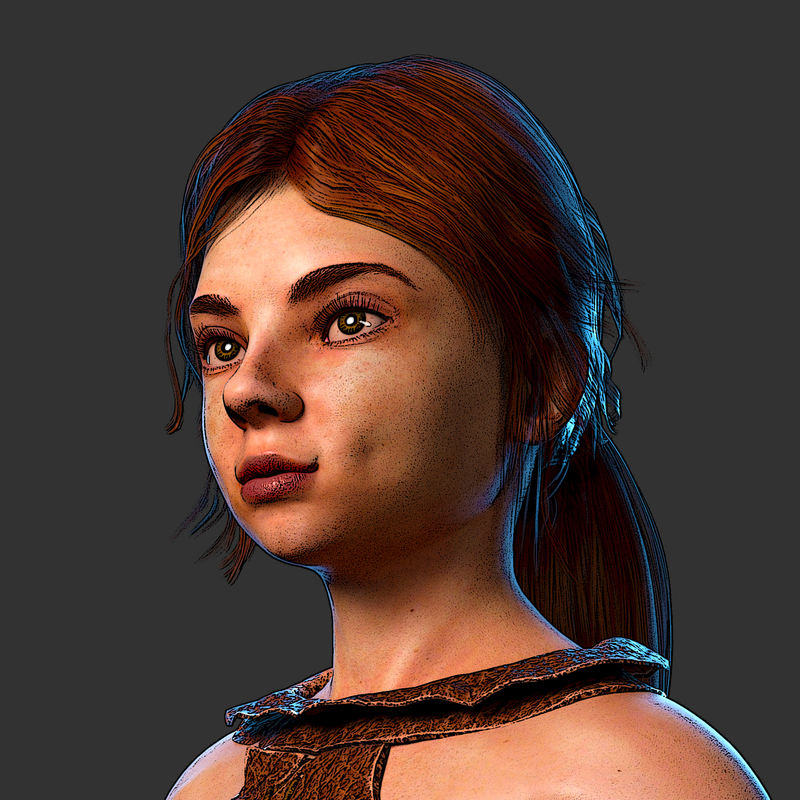 Her skin has been updated as I noticed 10 pages in that I was using a low-res texture the entire time on her face. Her eyebrows were literally fuzzy. We won’t see this look or some other character updates until Chapter 2, so Chapter 1 can stay consistent. However, before I wrap up Chapter 1, I will go over it and do some spell checking, script tightening and work on each of the character’s unique voices. The story won’t change and the panels won’t get re-rendered. Oh, I promise a suitable origin cover. Benne’s dad begins the search for our missing heroine. Though, she would say she’s no hero and you’re putting words in her mouth. 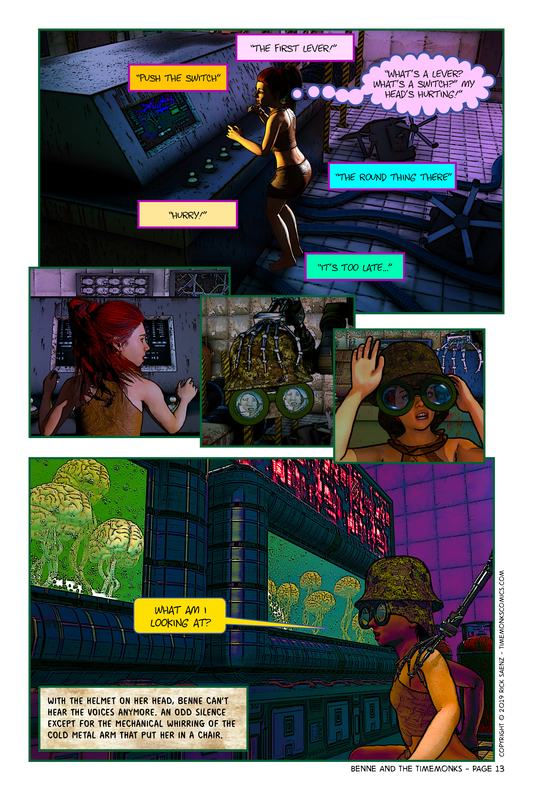 While the majority of the panels on this page were done the same way as most of the other panels, the last panel was rendered in Unity with outlines by UnityChan plugin. The saturation by Unity Post Processing and just a tad of sepia in Photoshop. Still hoping to pump out complete panels in Unity or Blender. It’s where I spend the majority of my spare time. Once I get it right, it should be quicker to release pages. With this chapter winding down, the next will probably have a slightly different style. Benne seems to have found the voices in her head are brains in a vat. The metal arm hanging from the ceiling has sat Benne down and shut the voices off by placing a helmet on her head. If there is a villain on the next page, they should certainly have a tale to tell. We’re back after a hiatus. Hope to get back to it on a semi-weekly basis. Spent some time thinking about the story some more and where it’s going. How the past will become clear to Benne. Also, learning some new software and getting better at ones I know. For some time I have been mainly using Reallusion iClone and Character Creator. With the recent Character Creator 3 release, it’s easy to get carried away with more realism. That’s not what a comic book is about, it’s about illusion. However, I did spend some time reworking our protagonist for Chapter 2 where the intention will be to use NPR (non-photorealistic) rendering directly in software instead of using Photoshop to alter the rendered output. To do that, I’ve invested time in re-learning Blender since it seems the best option. More on that before Chapter 2. For now, there are still a few more pages in Chapter 1. Does Benne escape the underground laboratory? Who is behind the mechanical arm and did they stop the voices from telling Benne something? What happened to Benne’s dad? Come back and find out! Took a little longer. However, did have a chance to understand where the story is going. What’s missing. What Benne is likely to be looking for. Or thinks she’s looking for. What she is likely to find. It’s never what we desire. The things we focus on. We are bugs unaware of the large bird looming over us. On another note, recently I noticed that on closer inspection Benne has fuzzy eyebrows and that leather she wears looks like wood. For chapter 2, I’m working on a new outfit and a new hair do. Part of working with 3d software does to you. I’ll have a post on that process. How to post number 2. Full of Zbrushing and Substance Painting. And don’t forget to read from the beginning on the home page. Until then, ignore the voices in your head. So we finally find out what’s behind all the mischief. Buried beneath the seaside mountain village lies a strange machine. The likes of Benne has never seen above ground. Finally, she sees the shiny stones and it’s not what she imagined. Lifeless and cold. A low hum and an unhealthy smell. Don’t forget to read from the beginning! And don’t forget to share. Thanks for watching! There is something below which is taking over the minds of the animals above. It was enough to wake an old rusted mechanical man from a peaceful slumber. Superstitious village folk believe that by sacrificing young girls or boys it would save them from destruction. It does seem that the Buddy is not concerned with the panicked villagers but is zeroing in on the dog. The dog’s manipulator knows his time is up. But, is it too late for him to leave the dog’s body and return to wherever he comes from? Benne is getting the worst of it. And if I know my tropes right, she will be meeting the mysterious ancient ones shortly. Either as food or as . . .
We are halfway through chapter 1 and it looks like Benne has met her fate. A giant robot stands between her and freedom from the mad crowd that wants to sacrifice her to the Vat™. As mentioned before, there is a rough outline for this story but when you create a new panel it does take a life of its own. That’s what so fun about making it up as you go along. When blocking out a scene the story comes alive and even I don’t know what might come next. Though roughly I would prefer the story not end. The squat lady pointing the finger at Benne is supposed to be the village witch, but we shall see if she isn’t so bad. A couple other timemonks round out the cast so far and we’ll meet them as we go along. But, the missing characters I wanted to crowd in to these scenes felt like to much, so I conveniently sent them away scared they would suffer a fate similar to Benne. Lastly, we see that the inside of this cave is actually part of an ancient ruin suspiciously looking like a modern tiled floor heavily aged and overcome by the seismic changes of time. How much time? The timemonks know. When decorating the inside of a cave, you should have animal skulls on the wall, animal furs for beds and straw mats for floors. Got it. But, I’m not sure how soon we come back to Benne’s cave to enjoy the ambiance! In movies you have establishing shots where you get to see the environment before the camera zooms in to the characters. But, I feel there is a lot of story to tell and I’d rather not spend too much time admiring the scenery. 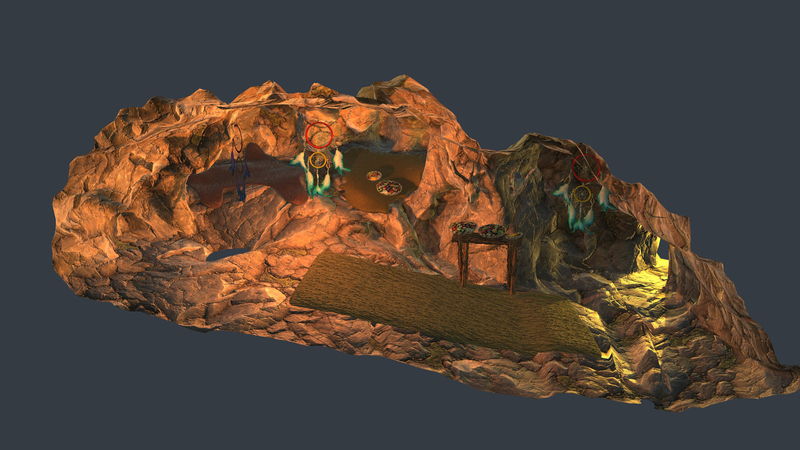 Here is a glimpse of what Benne’s seaside cave looks like so far. Much like a sitcom set there is only one side. We’ll come back later in the chapter. There’s plenty of food laying about, so no one is going hungry. I should probably put some claws on that bear rug in the meantime. Also, there’s supposed to be a cat and possibly a dog or two. Enjoy! Benne is home. But, what is home like? Who else lives there? Its been fun working on some new characters we’ll soon see. But first, can we please find out why life is so deceptively simple in Benne’s world? Will it stay that way? Benne seems destined to wander much farther than the ravine and possible deeper. What the best storytelling does is not tell you everything. Some things are left to your imagination. Its the same when you create art. So much is left behind. All the hours working on a scene that will never be good enough. Characters that don’t make sense even if they did in the rough draft. And if your medium is 3d, a million brushes to learn. The Buddy has been sleeping a long time, so he’s pretty roughed up. It’s so much easier with Substance Painter. So is the ground, so are the hills, so are the rocks. If you click on the images you get a larger more detailed version. You can use the standard ways to zoom in. ctrl + or ctrl and the mouse wheel or two fingers natch. Proudly powered by WordPress Theme: Fanwood Light.